Folders are used to organize your sets. For instance, you may want to keep track of all the sets you've played at a specific venue so that you don't play the same songs. You may also want to track your sets based on the bands in which you play. Lastly, you may be playing a festival with multiple sets throughout the day. 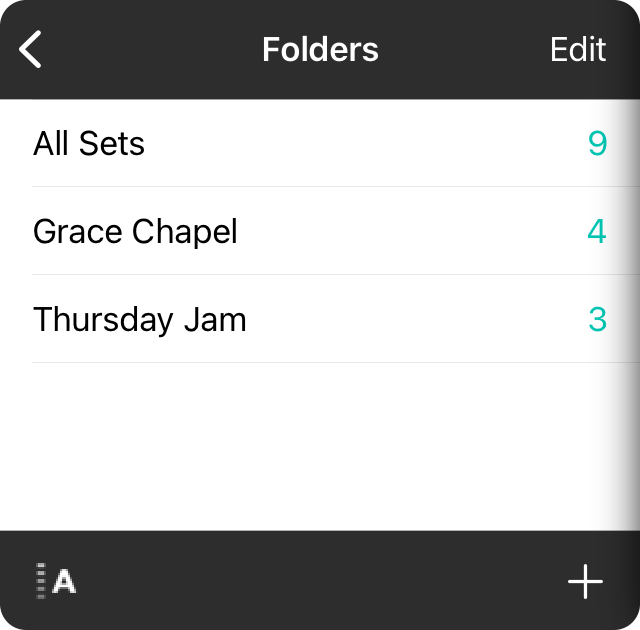 Whatever the need, folders let you organize your sets into collections. The folders screen is located at the root of the My Sets navigation. You may need to tap the button in the upper left corner of the My Sets menu to reach the folders screen. Once there, you can tap on the All Sets collection, or tap on the name of a folder to view its sets. Tap on the name of a folder to view sets contained within. You'll notice that each folder contains the quantity of sets contained in the folder. Note that this is the total number of sets whether they are active or archived. You can sort folders alphabetically or in a custom order. Tap on the sort button in the lower left corner to change the sort method. When you are viewing folders in the custom order, tap on the Edit button in the upper right to enter Editing Mode. You can then use the reordering handles to arrange your folders. Tap Done to save the folder order. You can also drag and drop folders to reorder them. Adding folders is as easy as tapping on the + button in the lower right corner. From there you can type in the name of the folder and tap Done. Tapping the Cancel button will not create the folder. While in Editing Mode, you can tap on the name of a folder to open an Action Menu, allowing you to choose from advanced actions.